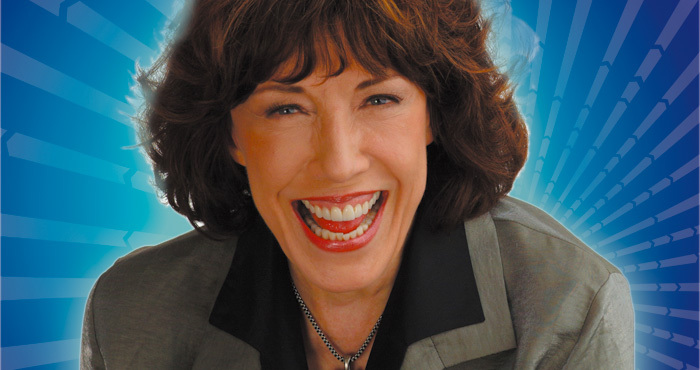 Overture Hall was filled to near capacity Wednesday night as Lily Tomlin took the stage. The evening got off to a rather bumpy start as the video featuring highlights from Tomlin’s career broke up into little digital squares then froze. The technicians fixed whatever was wrong, but as Tomlin appeared on stage, she was in an obvious agitated state—telling the audience how she worries all the time about trivialities such as “fat-free half and half” and “if the love of money is the root of all evil, will the United States be okay now that it’s broke?” She appeared to be suffering from a springtime cold, as she coughed occasionally and her voice sounded a little rough. In addition to Ernestine, the audience was treated to a visit from Lucille, the woman who secretly eats erasers and confessed that she had eaten 20 pencil erasers a day, but her greatest pleasure was eating a brand new “Gum eraser with the corners still sharp.” As the story unfolds, Lucille tells of her rehab, kneeling on the floor before the psychiatrist, begging for help—and then eating his crepe soles. In another skit with portraying Beasley, Judith is calling her son “Billy” in for dinner. She opens an imaginary door, and calls for him to come in—“Supper’s ready!” There is no response, so she walks ‘outside’ and off the ‘porch’. A land mind explodes. “Now who put that there?” She queries. As bombs and guns explode around her, she goes through the monologue of a mother calling her child in for dinner. When Billy finally shows up, she asks him “Now, where is your leg? Oh, never mind. You can go get it after you eat.” It is that kind of juxtaposition of the everyday experience and the ravages of war that Tomlin is so gifted at portraying. She is definitely funny and yet somewhat poignant in the characters she’s created. One of Tomlin’s gifts is her ability to make her characters so real. One of her skits involved 2 women (both portrayed by Tomlin). One, a very wealthy woman says to the impoverished woman “See my new dress? See how beautiful it is? See my new shoes? My father paid a lot of money to buy me these new clothes.” The impoverished woman responds, “See these raggedy clothes? My Father is going to give me a white robe, some day. See my old shoes? My Father is going to give me gold slippers one day.” The wealthy woman responds “See that big house on the hill over there? My father paid a lot of money to buy that house.” The impoverished woman answers “See that hill that the big house stands on? My Father owns that big hill.” Both characters are completely believable, both describing their perspectives with 100% accuracy. That is Tomlin’s gift.